AWS Case Study: Ricoh Company, Ltd. The company's business has grown into a wide range of fields -- primarily solutions, services and products that create new value when people interact with information, including digital cameras and industrial products. Ricoh Japan Corp., which provides information system services and sells Ricoh products in Japan, was entrusted by Ricoh Company, Ltd. to construct and operate the AWS system. Ricoh Japan Corp. not only provides systems for Ricoh Group, but also offers system building and operating services for customers. The company is expanding its services that make it easier to use AWS and is enhancing its cloud business for major enterprises and medium-sized firms. Specifically, the company offers systems configured for the high requirements of medium sized firms packaged using AWS, custom services tailored for major corporations such as the Ricoh Design Service for AWS (from design of AWS and systems that operate on AWS to construction, introduction and migration to AWS) and the Ricoh Management Service for AWS (monitoring and operation of AWS and systems that operate on AWS). The current system employs the Ricoh Design Service for AWS and the Ricoh Managed Service for AWS. We support business activities for our customers, many of which are global businesses that are among the Fortune Global 500, under the organization named the Ricoh Global Services (RGS). RGS used to employ Microsoft SharePoint to enable its global sales team and professional technical support team to share information with clients all over the world to support all sorts of projects and customer needs. For system infrastructure, the company used to use a hosting service in the US, but cost was a significant issue. Given this situation, RGS first began considering using a cloud service in 2014. 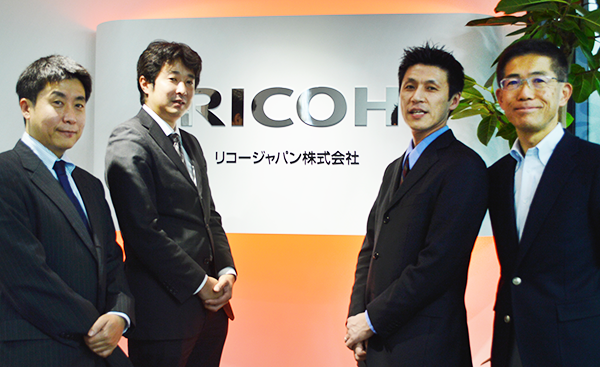 A proposal to construct a system for migration was received by Ricoh Japan, and the project was started in June 2014. The deciding factors for adopting AWS were: (1) a large number of business case studies ; (2) an abundance of certifications acquired from third party institutions; (3) the fact that AWS was already used at many places within the Ricoh Group. With regard to the first factor, AWS representatives informed us that the case studies disclosed were just the tip of the iceberg, and that a large number of businesses were already using AWS. Concerning the second factor, the company had acquired many more certifications required by US government institutions than any of its competitors. We do a lot of business with the US government, and certifications are always required to prove reliability. And with regard to the third factor, Ricoh already had a lot of experience using both commercial cloud services and internal systems. 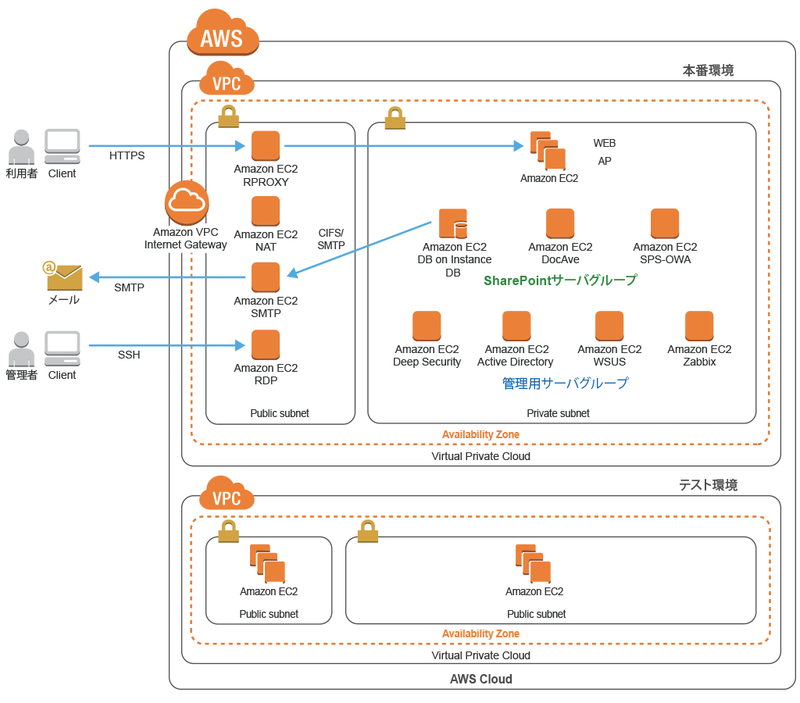 The fact that it facilitates use in regions other than Japan, employs SSD, and adopts the latest technologies such as Amazon EBS Volume Snapshot, were also significant factors that led to us to choose AWS. The adoption of AWS cuts problematic operating costs to approximately one-third that of the old system, leading to a huge reduction in overall cost. (1) Enables you to start from minimum sizing requirements and you can promptly add on and optimize later as needed. What's more, redundant configuration enables preparation at minimum cost. (2) Hardware can be procured from order to installation by console, thereby dramatically cutting time required to get the merchandise. We strongly feel that the "on-premise" concept provides a whole different level of flexibility. In the future we would like to take advantage of up-to-date cloud service technologies as well as cost reduction. We are therefore considering using services such as Amazon RDS and database mining. The adoption of AWS cut problematic operating costs to approximately one-third that of the old system. It is therefore connected with a huge reduction in cost in comparison with the previous system. Easy to sign up! You can try applicable product for 12 months free of charge within the scope provided. If you need information, would like an estimate, or have any questions, please feel free to contact the AWS Japan team. In addition to the billing system and quotation method, this presents recommended configurations that frequently use the AWS cloud.